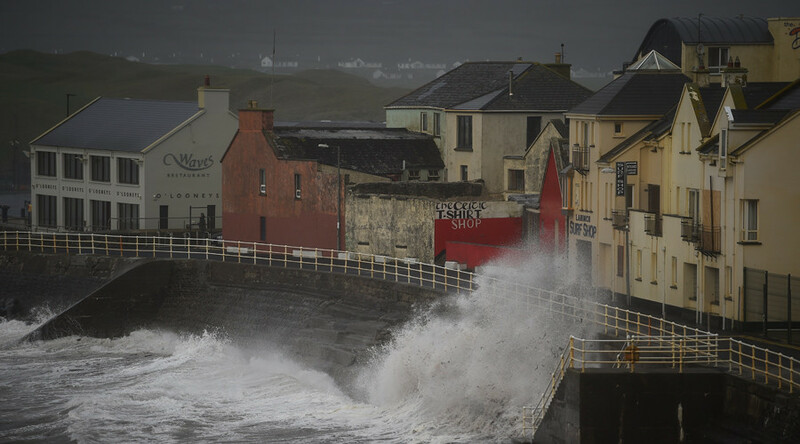 Three people have been killed in Ireland as hurricane-force winds batter the country. Ex-hurricane Ophelia is wreaking havoc across the island, leaving 385,000 homes and businesses without power. The first victim, a woman in her 50s, died when the car she was travelling in was struck by a falling tree in County Waterford, in the country’s south-east. In County Tipperary, meanwhile, a man in his 30s died while trying to clear a felled tree with a chainsaw. The third death occurred when a tree fell on a car in County Louth. Irish authorities issued a status red weather warning on Sunday night, designated Ophelia a ‘national emergency’. With gusts of up to 170kph (106mph) ripping through the country, citizens have been urged to stay indoors and not to attempt any unnecessary journeys. All schools, colleges and childcare facilities closed on Monday, while the majority of hospital appointments were also cancelled. The Department of Education also confirmed that all schools will be closed on Tuesday. Many businesses also shut on Monday, while the majority of transport services in the country ceased to operate from early morning. Some 130 flights were also cancelled at a number of the country’s airports. Reports from around the country tell of roofs being ripped from various structures, including one football stadium in Cork City. Falling trees have also made some of the country’s major roads impassable. The storm made land on the country’s south coast early on Monday, before moving northwest throughout the morning, spreading east in the afternoon. Though Ireland is no stranger to windy and rainy conditions, extreme weather events such as Ophelia are very rare. The last time the country experienced such an event was more than 50 years ago. That storm resulted in the deaths of 11 people.